Board index General General Discussions NOTICE: New Star Wars Commander Content Soon! NOTICE: New Star Wars Commander Content Soon! Re: NOTICE: New Star Wars Commander Content Soon! Weird. Yesterday I could buy crystals from the iOS app... today I am getting a message that in-app is disabled, but I didn’t change any settings. Hot fix oops? 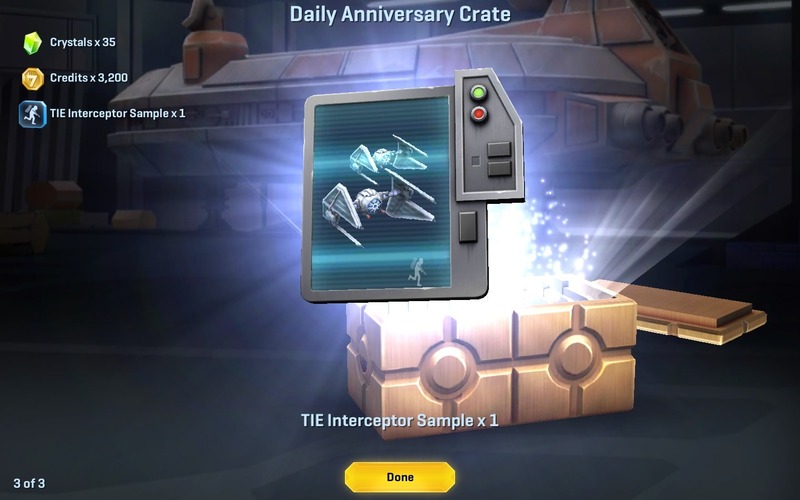 EDIT: I just opened my Daily Anniversary Crate for my 2nd Imperial acc (HQ 7) and got 35 crystals. The Add Crate gave me the normal 2 crystals. Oh those Dekka were SWEET!!!! We filled up our War Sc's one time with them and barely lost a star hahaha! Love them! Although... i'm all about the monsters!!! I’m still hoarding those dekkas in my HQ like Gollum hoarded his precious. I should use them in a non-takodana squad war. Next up it looks like we have 2 weeks of galactic conflicts. First week will be for the troop transport and the second week will be for the atst skin. More info and details to come. Spock wrote: Next up it looks like we have 2 weeks of galactic conflicts. Thx for the info Spock. I am a little surprised and disapointed, if it is just conflicts. It is just a repitition of the conflicts before the current event. I expected a whole event with trooptransporter and ATST/T2-B skin. Perhaps the event will follow the 2 weeks of conflicts. Or could it be, that Disney will not bring out any new stuff? New stuff will only come after zynga took over?